Leanne Pooley's work as a documentary director has encompassed the arts, religion, politics and true-life adventure. Born and raised in the Canadian city of Winnepeg, Pooley emigrated to New Zealand in the 1985. Her first experience of directing documentaries was on TVNZ's First Hand series in the early 90s, which saw young filmmakers set loose with video cameras. In episode 'Worship a Game', Pooley went behind the scenes of a rugby clash between Auckland and Ireland. After relocating to Britain, Pooley "found herself as a filmmaker" during a five year period where she worked for the BBC, Channel 4, and London Weekend Television. Based in London but often travelling, she directed documentaries which screened in more than 100 countries, covering everything from in-laws to genetics to papal elections. Six-part series Deadline went behind the scenes of a regional news channel. Another doco, Eyewitness - Pond & River, was part of an Emmy Award-winning series co-produced by the BBC and PBS. 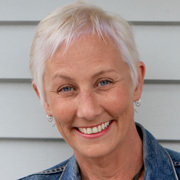 In 1997 Pooley returned to New Zealand, where she set up Spacific Films. Her first Spacific production was Relative Guilt, made for TV3, which was named Best Documentary at the 1999 Qantas Media Awards.The film examines the abuse experienced by the family of convicted murderer David Tamihere. She also produced Peta Carey's Kiwi Buddha, about the Southern Hemisphere's first Buddhist High Lama, and NHNZ heart disease doco The Man Who Has Everything, directed by Keith Hunter. Haunting Douglas (2003), Pooley's film about dancer Douglas Wright, brought wide acclaim. Variety reviewer Ronnie Scheib called the result "expertly crafted", arguing that it "savvily incorporates conflicting agendas: He was only interested in showcasing his art, she was intent on uncovering his bio." A finalist at the San Francisco Film Festival, it won Best Documentary at Sydney's Reel Dance Awards in 2004. Pooley won further attention with The Promise, about euthanasia advocate Lesley Martin. The Promise won the Best Documentary award at the 2006 NZ Screen Awards. The following year Try Revolution, the story of how the 1981 Springbok Tour of NZ impacted on South Africa, was a finalist for Best Director and Best Documentary. In 2007 she directed Being Billy Apple, a documentary about the eponymous conceptual artist, made as part of TV One's NZ Festival series. 2009's Topp Twins: Untouchable Girls became the most successful Kiwi documentary to win theatrical release; its $1.85 million local gross catapulted it into the top ten NZ films to date. Built around a concert which was written specifically for the documentary, the film tells the life story of Kiwi comedy and music icons Lynda and Jools Topp. Pooley argues in this interview that it is also a chronicle of social change for the nation as a whole. "Every really important social change that's happened in New Zealand over the last 30 years the twins have been part of, and in some cases provided a soundtrack for." In October 2009 Pooley took Untouchable Girls to the Toronto International Film Festival, where her parents were among the audience; releases in Australia and the United States followed, along with 20 awards, including audience favourite awards from Toronto to Melbourne. Pooley's next project attracted her because it marked her first "big epic, dramatised action film". Based on a 1914 expedition to the Antarctic, telemovie Shackleton's Captain stars Craig Parker as Frank Worsley, the Kiwi sailor who navigated a tiny life boat on a rescue mission across 800 miles of ocean. Made with German and NZ funding, the result was nominated for Best Feature/Drama Documentary at the 2012 NZ Film Awards. Pooley wrote Shackleton's Captain with her longtime editing colleague, Tim Woodhouse. Pooley followed it with another film inspired by real life adventure: Edmund Hillary's 1953 ascent of Everest. Beyond the Edge, made in 3D, mixes archival footage with dramatised footage, some of it shot on Everest itself. Beyond the Edge debuted at the Toronto International Film Festival in September 2013. The Toronto Star praised it as "gorgeous", "thrilling and dramatic"; Pooley was awarded a Moa NZ Film Award as Best Documentary Director of 2013. 25 April saw Pooley trying another new challenge. The film uses animation to tell the story of Gallipoli through the eyes of six ANZAC soldiers. Once again, 25 April was invited to debut at Toronto. As for using animation to tell the Gallipoli story, Pooley argues that it allows viewers "to really experience what they went through from an entirely new perspective. There are no limitations to how the story can be illustrated." The result was nominated for Best Documentary at the 2017 Moa Film Awards, and Pooley for Best Documentary Director. In 2011 she was named as a New Zealand Arts Laureate, including a $50,000 grant to further her artistic endeavours. Pooley also produced feature-length Zimbabwe documentary Finding Mercy (2012), directed by émigré Robyn Paterson. Active in industry affairs, Pooley is on the executive of the NZ Directors Guild, and has served as a judge for the International Emmy Awards.